I'm in love with this chest from Horchow. In many ways, it is my jumping off point and the inspiration for how I want to decorate our new house. I love the natural wood for its organic aesthetic. It's unpretentious and yet I would probably hang an ornate gilded mirror over it to meet and greet guests in the entry. The good news, it's on sale. The bad news, it could be a little too big for the entry with its 24" depth. I don't think I care! Moving to the kitchen, I have a challenge working with a small space that I want to carve out for a small kitchen eat-in area. Originally, I was going to put a hutch, plus a round table in this small area, but there just isn't enough room for both. Then I found this banquette at Ballard Designs which is perfect to place against the wall. I love that I can customize it with camel check and brass nailheads. At 48" wide, it's perfect with a round table the same size. 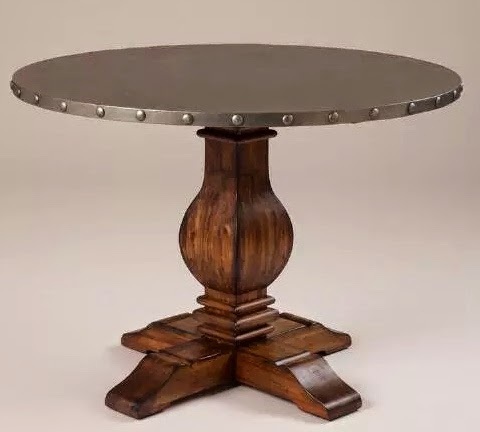 There are a lot of options for round tables online. I found this one at Restoration Hardware and like it for its stained black wood--also organic and in the color family that I'm planning for the kitchen and whole house. Black, white with accents of camel. Another, less expensive option is this 42" round table from World Market. I love the metal studded top, but not the base. But at $250, I could paint the base black and would save a lot of money! I already have these burlap unholstered chairs. Placing just two of them on the other side of the table and hanging a pendent or small chandelier over the table will complete the breakfast area. I also plan on hanging the six vegetable botanicals I found at the Paris Flea Market on the wall behind the banquette. 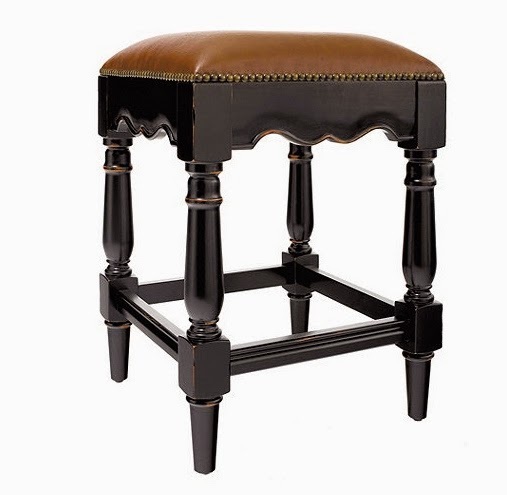 For seating at the kitchen island, I'm considering these counter stools from Ballard Designs. Once again, I like them for their black legs, but more importantly, I love the honey brown leather top and brass nailheads. They will coordinate nicely with the banquette fabric in the same room. Now I just have to find two club chairs for the kitchen sitting area in a fabric that will go with it all. So far, this is as far as I've researched the kitchen occasional chairs because I'm smitten with this chair from Williams-Sonoma! It will definitely go with the camel check banquette and counter stools. I don't dare cost it out! Still looking for alternatives as I have lots of time and I enjoy the hunt! I can not wait to see what you choose. It is such fun planning a space. Have fun. Beautiful pieces! I know everything will be lovely! Love the chest as well, it's a great direction to go with. 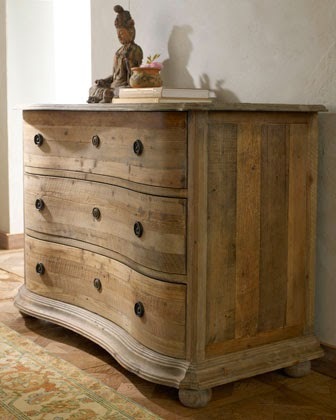 I have pieces in this raw weathered feel yet more French in design. What ever you chose it will be fabulous. Delores, I picked up the new issue of "New Classic style"
A wonderful feature, I cannot wait to see your new reveal in your new home! Easter grace to you and yours. Delores, Everything will be beautiful and I am in love with the banquette. Love everything! Where did you get the bar stools? Can't wait to see the finished product! It all sounds wonderful Delores! Hope to see it one day in person!! 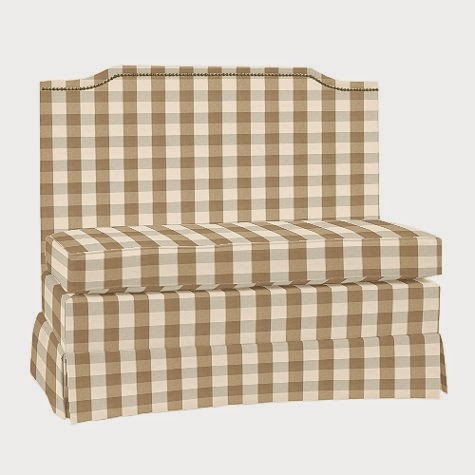 The buffalo check banquette with the RH table is just dreamy!! Love it all! Where are the stools from? I love all your choices and can hardly wait to see it all put together. Those counter stools are from Ballard Designs. I love online furniture shopping, too!! It can get a bit dangerous! How gorgeous is that natural chest? Love Horchow!! FYI - Delores those chairs for the sitting area are also available from Lee Indsutries. Don't know about the fabric as i have not ordered from them recently. Delores, the small banquet is a great choice with the round table. I love the choices you've made. It's fun to follow along as you go through this process. Aahh! I'm in love. I actually have that chest, but got it from Arhaus about three years ago. It's one of my faves. Mitchell Gold and Bob Williams have a chair that's very similar although I can't find my notes on the style. I had planned to buy it in the Vestige-Mushroom (#102084) but hesitated. I'm happy I did because now I'm moving and will now be ordering two of them!! FYI, Mitchell Gold et al are having a 20% off sale right now. Oh my gosh I love the direction!!! Black, white and camel!! Funny thing, I've been offline for a week and am running through my favorite blogs. I opened yours and was thinking it was another gal's blog. First thought was, I didn't know she was moving or getting a new home. Next thought, wow, did not know she had such great style, I am loving every piece of she has chosen. Came to the close of the blog post...and realize I'm at your blog...of course I love everything Delores picks out! !